Arguably two of the finest exponents of their respective trades in the history of the game, the rivalry between batting maestro Sachin Tendulkar and spin wizard Shane Warne was nothing short of folklore. Ever since the two announced their arrival on the big stage with a string of scintillating performances, cricket fans waited with bated breath for the two to lock horns across the 22 yards. While Warne was a nemesis for batters around the world for an extended time period, it would be safe to say that no other batsman dominated the Aussie leggie the way Tendulkar did. Little wonder that Warne -- ranked second in the all-time highest wicket takers’ list in Test cricket with 708 scalps -- has dismissed Tendulkar only 4 times in his 29 international encounters against the Indian legend. The seeds of the rivalry were sown early into Warne’s career –- in his debut Test against India at Sydney in January 1992. A rookie Warne, 22 at the time, was smashed all around the park by Ravi Shastri (206) and Tendulkar (148 not out) as India amassed 483 in the only innings of the drawn Test it batted in. A hapless Warne returned with forgettable figures of 1/1150 in 45 overs! However, the early setback didn’t perturb the spinner from Victoria, who only grew from strength to strength with every passing match. And by the time Australia, under Mark Taylor, toured India for the three-Test Border-Gavaskar Trophy in March 1998, Warne had rightfully established himself as the leading spinner in the world while Tendulkar dominated the batting charts. The build-up to the series centred entirely around the impending Warne-Tendulkar duel, with Aussies hoping the spin king to settle scores with one of his biggest rivals. Tendulkar too didn’t leave any stone unturned to get battle ready and had former India leg-spinner Laxman Sivaramakrishnan bowl in the nets, at the rough outside the leg-stump to prepare for Warne’s line of attack ahead of the series. And it was Tendulkar who won the first battle. Australia played a three-day tour match against Mumbai, which was captained by Tendulkar. Batting second, Mumbai lost 2 quick wickets, and in came Tendulkar. The famed contest had started. But over the course of the next two sessions, Warne was ripped apart by Tendulkar who smashed his maiden first class double century (204 not out). Warne’s figures read 16-1-111-0, as Mumbai won by 10 wickets. However, Warne bounced back in the first Test played at Chennai, dismissing Tendulkar cheaply for 4 in the first innings for figures of 4/85. But what followed in the second innings, was sheer masterclass from Tendulkar. He smashed Warne to all corners of the ground. When Warne came from round the wicket, trying to bowl Tendulkar around his legs, Sachin used the sweep shot to perfection, thwarting all his plans. Tendulkar hit an unbeaten 191-ball 155 to fashion India’s victory while Warne’s 30 overs cost 122 runs! In the second test at Kolkata, Tendulkar continued his good run, hitting a fluent 79 in the only innings India batted, as the hosts cruised to comfortable 219-run victory. Warne failed to pick up a single wicket. Though the visitors fought back to win the inconsequential final Test at Bangalore, Warne once again failed to solve the Tendulkar riddle, with the latter smashing 177 India’s first innings. Big words, coming from a champion bowler. The Monkeygate scandal is perhaps the worst incident to take place in a cricket match involving India and Australia. 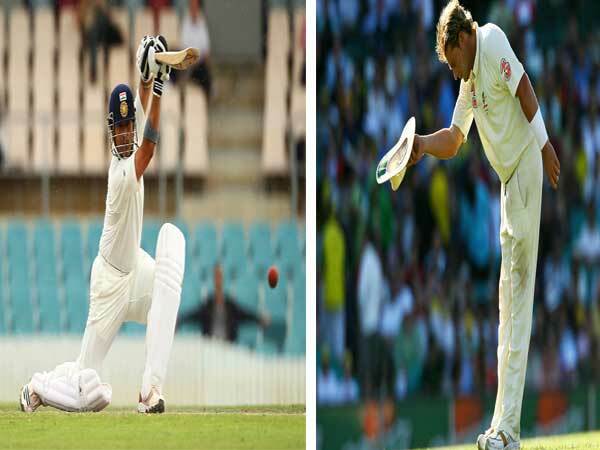 During the second Test of the Border-Gavaskar Trophy at Sydney in January 2008, Andrew Symonds and Harbhajan Singh got involved in a most ugly standoff in a match already clouded by questionable umpiring decisions going against the visitors. Matches involving India and Australia have always had a heightened element of acrimony. But things just went out of the hand during the New Year’s Test at Sydney. It was on the third day of the Test and Harbhajan had just reached his half-century when his altercation with Symonds occurred with the latter accusing the Indian off-spinner of racially abusing him by calling him a monkey. Non-striker batsman Sachin Tendulkar, Harbhajan and Australia’s Symonds, Ricky Ponting, Adam Gilchrist and Matthew Hayden were all then asked to present evidence before match referee Mike Proctor, who sided with the Australians, stating “I believe one group is telling the truth,” handing the spinner a three-match ban. India lost the Test under controversial circumstances with umpires Steve Bucknor and Mark Benson being publicly criticised by Indian captain Anil Kumble for their poor decision making during the match. India also appealed against Harbhajan's ban and was even contemplating boycotting the rest of the series until he was cleared of the charges. The visitors, however, decided to play the remaining matches and even pulled off a memorable victory in the third Test at Perth. Harbhajan was later acquitted of racism charges in an independent ICC hearing, but was fined 50 per cent of his match fee for using abusive language. This happened after Tendulkar testified that Harbhajan had actually said ‘Teri maa ki’ (an expression prevalent in North India), and not ‘monkey,’ as was alleged by Symonds. The late Jasubhai Motibhai Patel aka Jasu Patel is best remembered for a remarkable performance in the 2nd Test against Richie Benaud’s Australia at Kanpur in December 1959. Not only did the off-spinner single-handedly bowl India to its first ever Test victory over Australia, his 9/69 in the first innings remained India’s best Test bowling figures till it was overtaken by Anil Kumble nearly 40 years later. The victory was sweeter as earlier on a tour to England, India had lost all the five Tests before losing the first Test against Australia at Delhi by an innings. On the eve of the second Test, chairman of selectors Lala Amarnath sprang a surprise by picking up 35-year old Patel who had not played a Test in the past three years. Amarnath reportedly thought that Patel’s unorthodox action would be ideal on the new turf pitch at Kanpur. But things didn’t start well for the hosts, as Alan Davidson and Benaud shared 9 wickets between them to fold India for a paltry 152 on Day 1. On the second day, Patel dismissed opener Gavin Stevens but Australia raced to 128/1 at lunch, as India stared at yet another humiliating Test defeat. At lunch, Lala Amarnath had a supposed conversation with captain GS Ramchand and suggested using the off-spinner from the other end so that he could exploit the roughs created by Davidson and Ian Meckiff, both left-armers. And the ploy worked like magic. From 128/1, the Australians were bowled out for 219. Patel’s spell read 8/24 as he ended with figures of 35.5-16-69-9! India showed more spine in the second innings, scoring 291 with opener Nari Contractor leading the charge with a gutsy 74. Chasing 225 for victory, the visitors once again failed to find a way to tackle Patel, who ran through the Aussie line-up for another five-wicket haul. Benaud’s men were bundled out for just 105, losing the match by 119 runs to hand India a historic victory. Patel’s figures read 25.4-7-55-5. His match haul of 14/124 remained an Indian record till Narendra Hirwani went past him with his 16/136 against the West Indies in 1988. Former India batsman and chief national selector Sandeep Patil’s maiden Test hundred will be forever etched in the minds of cricket lovers. While it was very much a Patil-like innings, aggressive, gutsy and full of strokes, what made it more special was the backdrop. In the first Test of India’s 1980-81 tour at Sydney, Patil was forced to retire hurt following a brisk 65 after receiving a blow on his head from a Len Pascoe bouncer. It was in fact the second body blow he took in the innings after Rodney Hogg hit him on the throat. The blow from Pascoe was so severe that Patil had to be rushed to the hospital where he was kept under observation in the intensive care unit. Yet the brave hearted batsman returned to the ground and even batted at number 8 in the second innings. India lost the Test and Patil reportedly couldn’t hear with his left ear for the next few days. But two weeks later, this time with a helmet on, Patil responded with a spectacular 174 in the drawn second Test at Adelaide. It came after India lost the first four wickets for 130 against the Australian total of 528. At the time the highest score by an Indian in Australia, Patil’s knock took a little over five hours and included 22 fours and a 6 over mid-wicket off Bruce Yardley. Coming against the formidable pace trio of Dennis Lillee, Hogg and Pascoe, Patil’s heroic innings is still regarded as one of the best overseas knocks played by an Indian batsman. The second Test of the Border-Gavaskar Trophy at Kolkata’s Eden Gardens in March 2001 needs no introduction, and rightly so. When a team becomes only the third side in the history of Test cricket to win a game after being asked to follow-on, the event achieves the status of folklore. World champions Australia came to India after 15 successive Test victories. The visitors made it 16 by crushing India by 10 wickets inside three days in the first Test at Mumbai. And by stumps on the third day of the second Test at Kolkata, the stage was set for No 17 and the first Australian series triumph on Indian soil since 1969. Australia scored 445 to which the India replied with 171. Following on, India was reeling at 232/4 on Day 3, still needing 43 to make the visitors bat again. It was then that two saviours in the form of VVS Laxman (281) and Rahul Dravid (180) played the innings of their lives to add 376 runs while staying unbeaten for the entire length of the fourth day. Laxman and Rahul Dravid defied the strong Aussie bowling line-up featuring Glenn McGrath, Jason Gillespie, Shane Warne and Michael Kasprowicz. By the time the two were dismissed on the fifth morning, the momentum had shifted towards India‚ prompting skipper Sourav Ganguly to declare the innings at 657/7. Needing 384 for victory on the fifth day, Steve Waugh’s men took the bait but were spun out for 212 with Harbhajan Singh, the hat-trick hero of the first innings, returning with figures of 6/73 for a match haul of 13/196. An amazing turnabout, to say the least!